Henry VIII (June 28, 1491- January 28, 1547) was King of England from April 22 (crowned on June 24), 1509 until his death on January 28, 1547. He became King of Ireland in 1541, having reigned as Lord of Ireland previously. He was the second son of King Henry VII and Elizabeth of York.He was created Prince of Wales after the death of his older brother Arthur Tudor. A dispensation from the Pope was necessary in order to allow him to marry his brother's widow Catherine of Aragon, and this was obtained on the basis of non-consummation. Following difficulties with Rome over his divorce from Catherine (which was not sanctioned by the Pope, who was under pressure from Catherine's nephew, Charles V at the time), Henry split from the Roman Catholic Church, seized many of the Church's assets, and formed the Church of England. This became final with the passing of the Act of Supremacy 1536. During 1513Thomas Howard, Third Duke of Norfolk, defeated the invasion attempt of James IV of Scotland at Flodden during Henry's absence at war against France. Henry's long rivalry with King Francis I of France was made more serious by the cooperation between France and Scotland, both Catholic countries. Henry and Francis had met at the Field of the Cloth of Gold in 1520. Peace with France was finally concluded in 1546. Henry VIII greatly improved English seapower and instituted an efficient navy. His flagship, the Mary Rose, sank in the Solent during a battle, and its retrieval during the 1980s provided valuable archaeological evidence about the period. It is now on display at Portsmouth. Throughout his life he was an avid gambler playing at dice, tables and cards. It is claimed by some that he was playing Primero at the time of Elizabeth's birth. Other card games played by Henry include cent, Imperial and Pope Julius. The other major achievement of Henry's reign was the Act of Union of 1536, which effectively brought Wales under English government, with the result that the first Welsh members of parliament were elected in 1542. Henry was proud of his own Welsh blood. Henry is also famous for his six wives. After divorcing Catherine of Aragon, he married Anne Boleyn on January 25, 1533. While Anne bore Henry a female child Elizabeth, she did not give him the male heir he so desperately wanted. For this reason he had her executed on trumped up charges of adultery and married Jane Seymour. Seymour gave Henry a male child, but she died shortly after doing so. The boy was sickly, and Henry reluctantly remarried, on the advice of his chancellor, Thomas Cromwell. Cromwell, like his predecessors, More and Wolsey, fell from favour and was charged with treason. His fourth wife was the German Protestant Anne of Cleves. Henry disliked her from the beginning, and had their marriage annulled after only a few months. He proceeded to marry Catherine Howard, a young cousin of Anne Boleyn, who, like Anne, was found guilty of adultery and executed for treason. His last wife was Catherine Parr, a more mature woman who had been twice widowed. None of his last three queens bore him any children. A mnemonic to remember the fates of his six queens is "Divorced, beheaded, died; divorced, beheaded, survived." 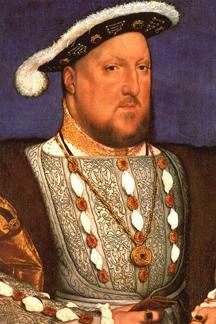 It is well known that, in later life, Henry was grossly overweight, and possibly suffered from both gout and syphilis. In his younger days, however, he had been a very active man. His increased size dates from a jousting accident in 1536. He suffered a thigh wound which not only prevented him from taking exercise but which gradually became ulcerated and may have indirectly led to his death. Henry died in 1547 at Whitehall in London and was buried at Windsor. At his death he left three children, each of whom had a turn on the English throne: Edward VI, Mary I, and Elizabeth I. There have been been many films about Henry VIII and his court. Two that bear mention here are the 1933 The Private Life of Henry VIII starring Charles Laughton and the 1972 The Six Wives of Henry VIII starring Keith Michell.